Great Ideas -- 20 Rockin' New Year's Eve Party Ideas! Great Ideas — 20 Rockin’ New Year’s Eve Party Ideas! New Years Eve is coming up soon! What do you do to celebrate?? We love a buffet of yummy treats and game night!! Here are 20 awesome idea to inspire you for YOUR New Year’s Eve activities!! 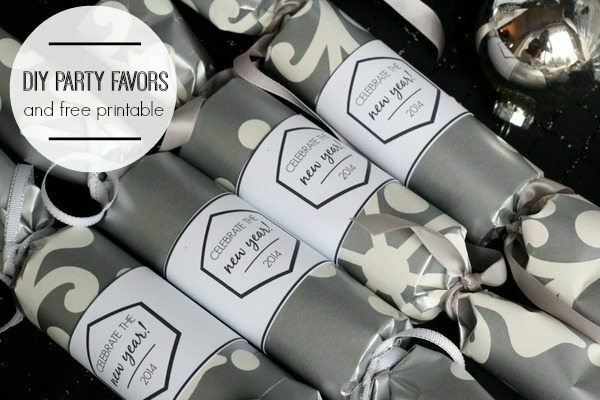 DIY Party Favors & Free Printables @ Design, Dining, + Diapers via Kleinworth & Co.
New Year’s Eve Kisses Printable @ Create. Craft. Love. Don’t forget to check out all of this week’s excellent projects for more last-minute holiday ideas! And don’t forget about this week’s giveaway from Paxton Cove! Paxton Cove is a cool boutique deals site — you’re sure to find a bargain you can’t resist! Great Ideas – 20 New Year’s Party Foods! love the 10 Rolls of Washi Tape GRAB BAG Super Deal!! I like the 10 Rolls of Washi Tape GRAB BAG Super Deal! Hi Jen – I shared on Facebook 🙂 Happy New Year !! I love all of that glitter! Thank you so much for sharing my nail art! McKenzie @ Girl Loves Glam recently posted…Messy Wavy Twist Hairstyle and Giveaway! What wonderful ideas! Makes me wish we were hosting New Year’s this year! My favorite at Paxton Cove is the 10 rolls of washi tape for $5.99. Have a super New Year! Thank you so much for sharing our Glitter Garland Jen!!! You’re the best! Hope you had an amazing Christmas and have a safe New Year!! Can’t wait to see what you’re up to in 2014! What a great list of New Years ideas! Thanks Jen for including my New Years Eve Party playlist! Have a great weekend! Debra Womack recently posted…Feeling old today. Love all the ideas. Found so many fun things to do for New Years. Have a wonderful New Year! Some spiffy deals at Paxton Cove! I like $5.99 | 10 Rolls of Washi Tape GRAB BAG Super Deal. That’s flipping awesome! What a fun and sparkly roundup! Thank you for including my printable Jen! I hope you have a fun New Year! Thanks for including my Clock Pops! Wishing you a wonderful year! What a great collection of ideas! Thanks so much for including my No-Bake New Years Treats! Have a super weekend and Wonderful 2014! the ten rolls of wash tape! So many fun and amazing ideas…love those sparkler toothpicks! Thank you so much for sharing my banana cake too 🙂 Have a great weekend! What a great round up! New Year’s looks so glittery and fun! Thanks so much for including mu champagne glasses in the list of great ideas. Happy New Year to you and your family! Love them all… Thank you so much Jen for sharing my projects. Love you to pieces! Love this round up Jen! Thanks so much for including my ideas sweet friend. xoxo Happy New Year! !